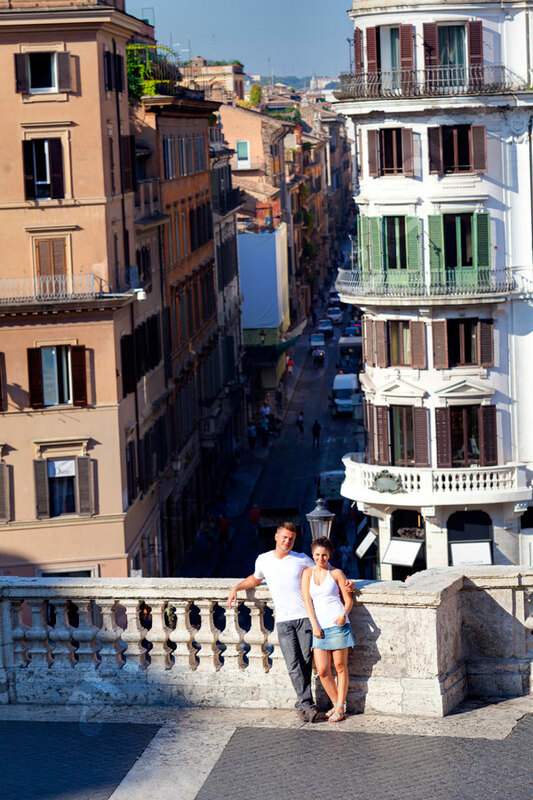 A nice engagement photo session which started at the bottom of Piazza di Spagna. Beginning on Via Condotti and into the nearby fashion district. Looking for some nice store showcases to use as backgrounds. There are some many beautiful ones to choose from. Casually mingling in with the people that are doing morning shopping on a warm summer day. Moving up the Spanish steps towards Church Trinità dei Monti. The Church has such nice architecture outside and inside the light shining in makes a remarkable effect to see. Then next store over was Parco del Pincio in the outskirts of Villa Borghese and overlooking the beautiful city of Rome from above. What a sweeping view from the terrace. You can see in the far distance at a 180°. Including wonderful sights like the Vatican and Saint Peter’s square. A beautiful photography morning with a beautiful couple! Great photos around the city and soon to married! A wonderful photo walk around the city with the intent to capture great pictures to celebrate the engagement. Lovely images with a cool and casual couple! Lovely job!